Dog Lichen was @SpeciesofUK from 2nd to 8th June, 2013. 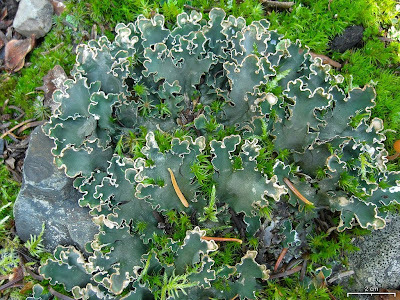 Peltigera, the 'dog lichens,' is a genus of about 91 species of lichen. Peltigera is from 'pelta' meaning small shield, in reference to its shape. Dog lichen can occur on moss, trees, rocks, but most often you'll see them growing directly on soil. They are just one grouping within the diverse and wonderful world of lichens! 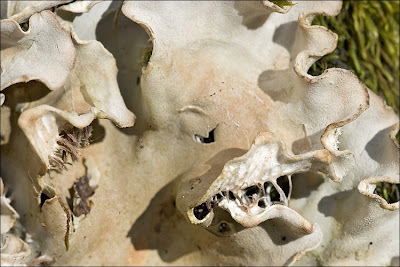 Lichens are truly remarkable. They’re a composite of two quite separate lifeforms. All lichens are composed of a) a fungus, and b) an alga or a cyanobacteria, living in perfect symbiosis. 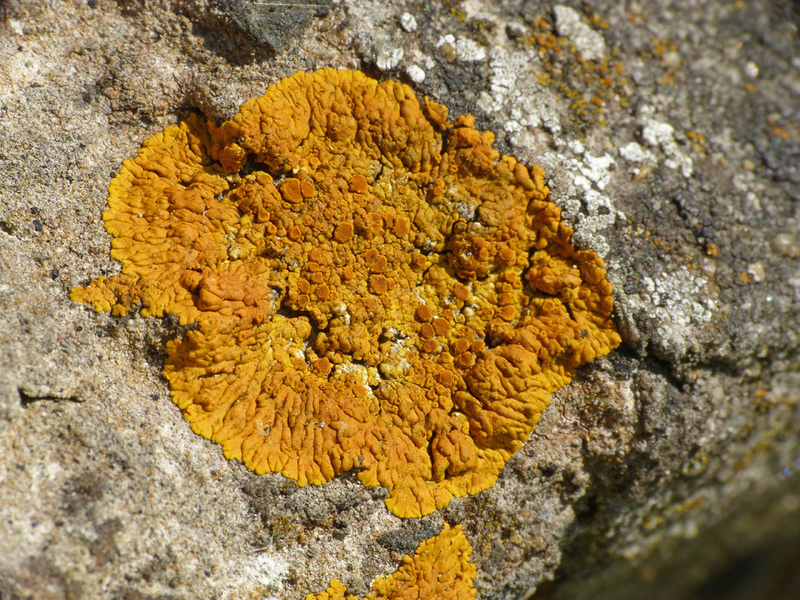 ‘Crustose’ or flat lichens, such as this, Caloplaca flavescens. 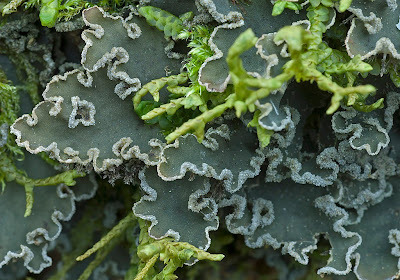 ‘Fruticose’ or branched/beard-like lichens, like this common one, Cladonia portentosa. 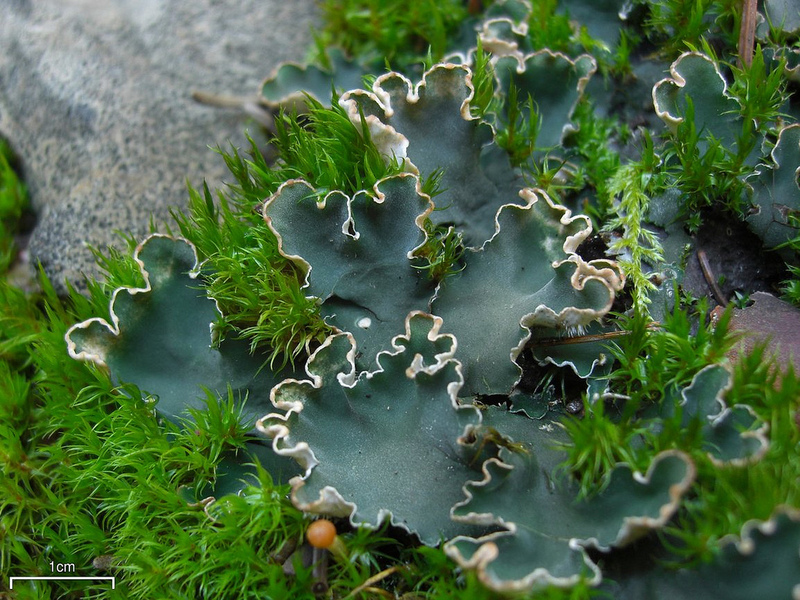 ‘Squamulose’ or scale-like lichens, such as Normandina pulchella (‘elf ears’). ‘Foliose’ of leaf-like lichens. Dog lichens fall into this group, alongside many other lichens. 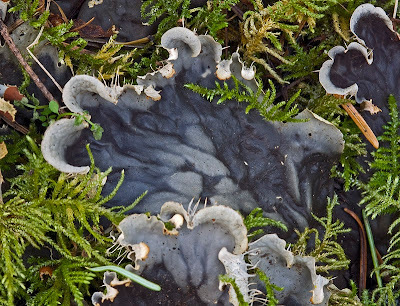 This dog lichen is Peltigera malacea. A widespread and common dog lichen in the UK is Peltigera membranacea. 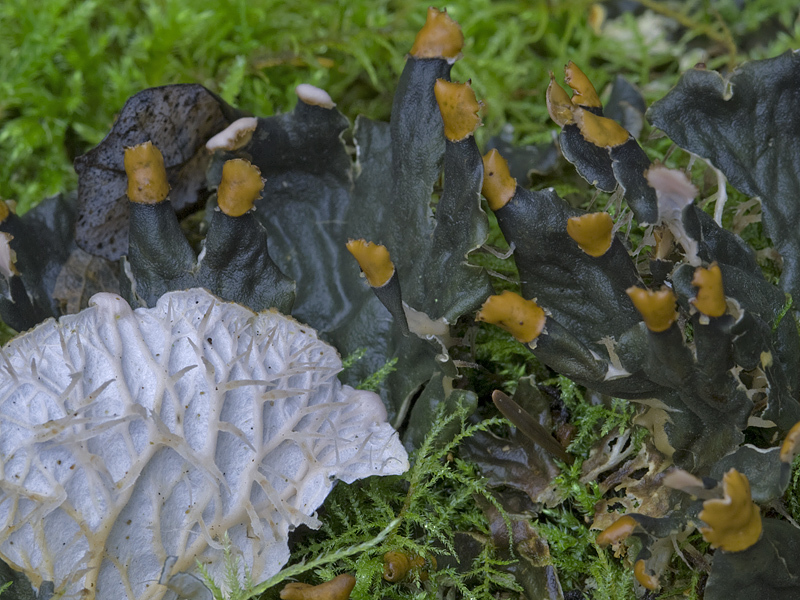 Peltigera membranacea can be found all over the UK. It appears in short, damp turf, as well as dunes, boulders and tree bases. It is a large dog lichen, bluish to brown-grey in colour, or a lovely silvery-grey when dry. 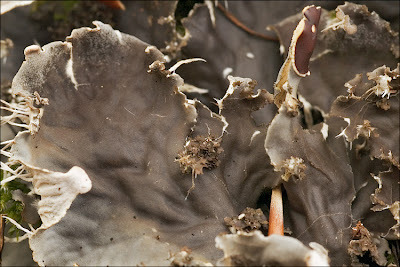 Its lower surface is white with ‘fang-like’ rhizines (hair-like growths). 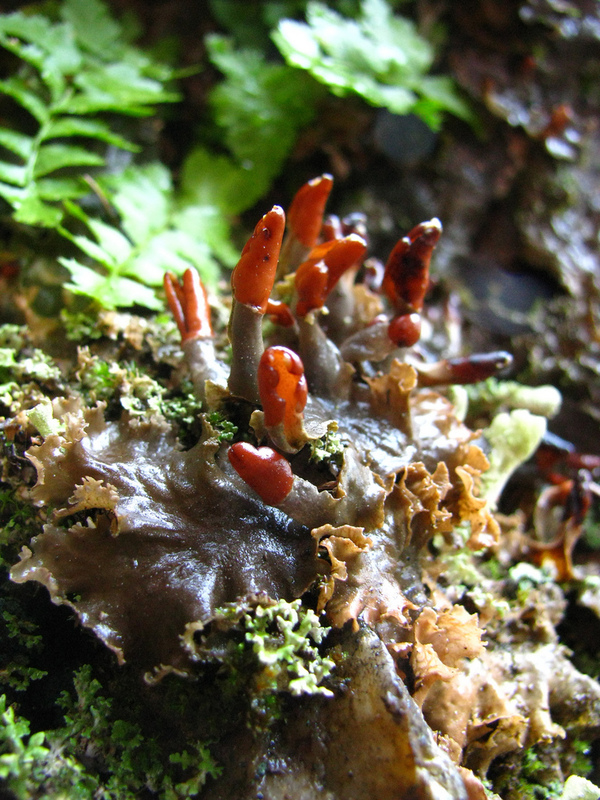 P. membranacea’s apothecia (reproductive structures) are reddish brown and saddle shaped. Dog lichen reproduction is a fascinating thing. No, really. 2) vegetatively (by 'soredia' or 'isidia'). 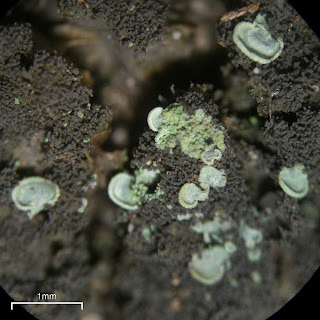 Reproduction by spores enables the lichen to spread across a larger distance. However, a BIG disadvantage for dog lichen of using sexual reproduction is that the spore represents the fungus part of the lichen only, so it needs to chance upon an algal partner to reproduce successfully. As a result, dog lichens also commonly reproduce vegatatively. They create fabulous little parcels of fungus-plus-photobiont called soredia and isidia that simple break away and set up shop nearby. 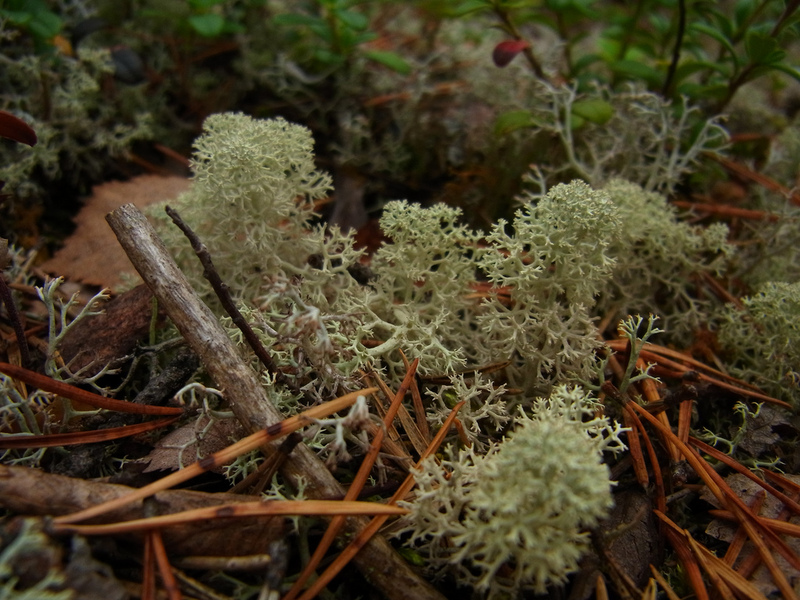 Dog lichen species come in a variety of forms. 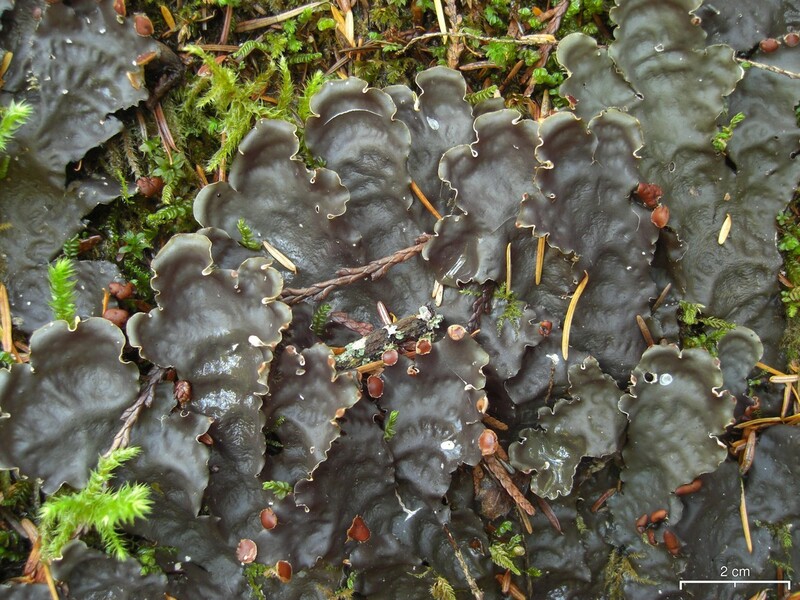 Here is a selection of the dog lichen species that can be found in the UK. 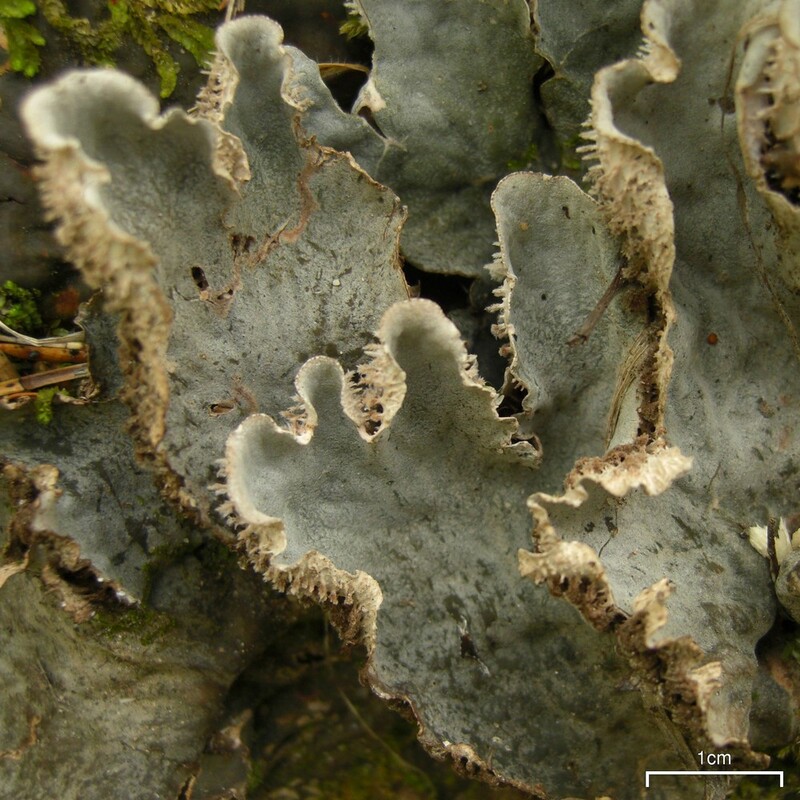 Peltigera canina is sometimes confused with P. membranacea but it is much smaller. It is widespread on dunes and gravelly/sandy soils. It grey-brown with convex wrinkles (‘bullate’), or ash-grey and lacking wrinkles when dry. 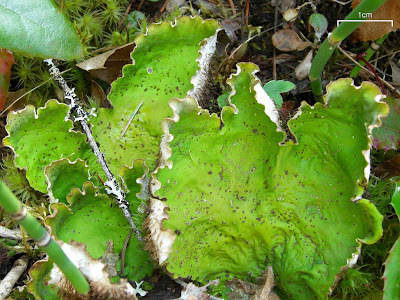 Peltigera britannica is bright green, browner when dry, with pale scars from cephalodia which have detached. It appears very locally in mossy, non-calcareous habitats, mostly in the north. Peltigera didactyla is formed of rosettes of small, rounded lobes, grey-green above and drying ash grey. 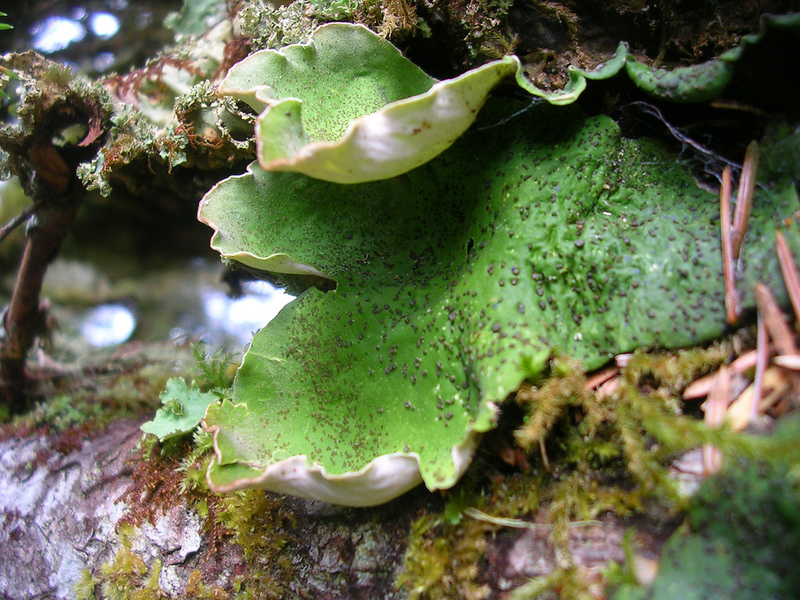 The underside has pale to brownish veins. It’s found throughout the UK on soil and bare ground. 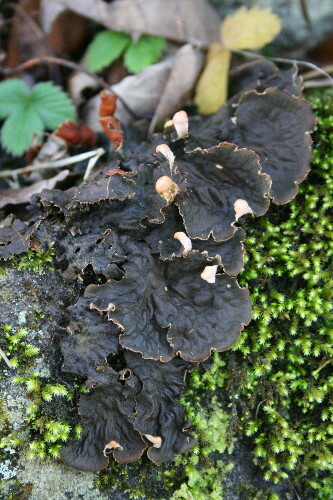 Peltigera horizontalis is rather broad. It’s brown or blue-grey. 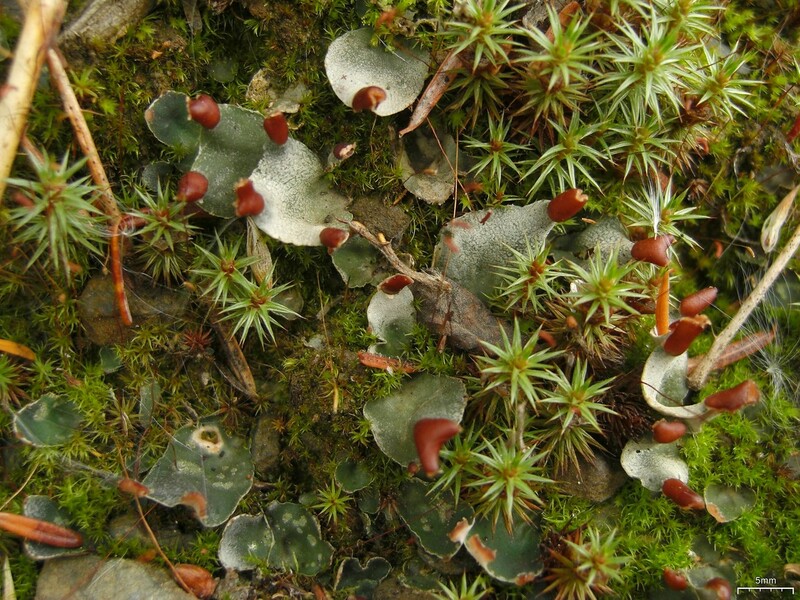 It appears on mossy stumps or rocks in older forests in the north and west. 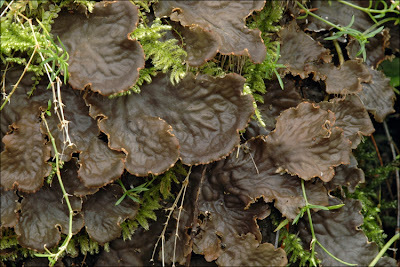 Peltigera hymenina is olive green to brown, much darker when dry. It’s smooth and lustrous. It appears on tree-bases, rocks and turf, in the north and west. Peltigera leucophlebia is bright green when damp, or brown when dry. It appears in mossy coasts or upland in the north and west. Peltigera malacea is rich, dark green and quite beautiful. It is very rare, appearing in the Scottish Highlands. Peltigera praetextata is tan to brown-grey, felt like. Peltigera rufescens is brown when damp and ash grey when dry. It is quite common in dunes and well-drained soil. P. canina has been used for a variety of medicinal purposes, including coughs, urinary disorders, thrush, TB and rabies.